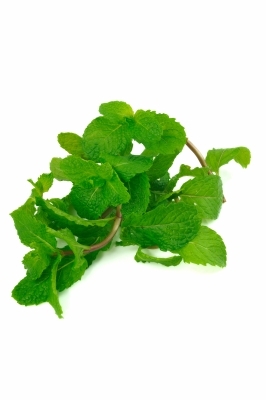 Rich in phenolic constituents and flavonoids, peppermint’s benefits include antiviral, antioxidant, antifungal, and antibacterial activities (which means that it may help to protect against colds, flus, and other types of infections, as well as major illnesses such as heart disease and cancer). Peppermint may also ease stomach complaints such as indigestion due to its ability to relax smooth muscles. Additionally, a phytonutrient in peppermint oil has been found to protect against cancer of the skin, lungs, and colon in animal studies. Peppermint has traditionally been used as a home remedy for many different conditions. Evidence suggests that it is an effective treatment for heartburn and may be beneficial for IBS sufferers. There has not yet been sufficient research conducted to evaluate its effectiveness for treating nausea, menstrual pain, cold and flu symptoms, and other health issues, though it remains a popular home remedy for many health complaints. Like rosemary, peppermint contains rosmarinic acid, which may help those with asthma to breathe more easily. Peppermint is also a rich source of vitamins A and C, as well as other vitamins and minerals. Peppermint is a staple in many Middle Eastern and East Asian dishes where it is more likely to be paired with meats and vegetables. In North America, it is more commonly consumed as a tea or in certain alcoholic beverages, added to salads and tomato-based soups, and used to flavour desserts, though it is also used in sauces, soups, and jellies.